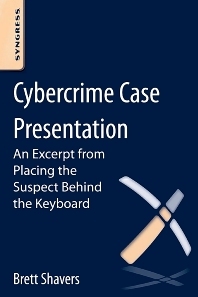 Information Security professionals of all levels, digital forensic examiners and investigators, IT managers, InfoSec consultants, criminologists, sociologists, attorneys, law enforcement officers, Also can sell to forensic training vendors, government training courses, and high-tech crime associations. Brett Shavers is a former law enforcement officer of a municipal police department. He has been an investigator assigned to state and federal task forces. Besides working many specialty positions, Brett was the first digital forensics examiner at his police department, attended over 2000 hours of forensic training courses across the country, collected more than a few certifications along the way, and set up the department’s first digital forensics lab in a small, cluttered storage closet.